Eleven Americans have been flown back to the United States as the Centers for Disease Control and Prevention investigates the possibility they might have been exposed to Ebola in Sierra Leone. The number could change as the investigation continues, Tom Skinner, a spokesman for the CDC, told CNN on Saturday. One scientist may have been exposed to the Ebola virus and as many as a dozen others are being assessed for potential exposure at a lab of the Centers for Disease Control and Prevention in Atlanta, agency officials said Wednesday. The potential exposure took place Monday when scientists conducting research on the virus at a high-security lab mistakenly transferred a sample containing the potentially infectious virus to another CDC lab in same building. When Dr. Martin Salia arrives in Omaha from Sierra Leone, he’ll be the 10th person with Ebola to receive treatment in the U.S. The surgeon was heading Saturday to the Nebraska Medical Center and was expected to arrive in Omaha at around 4 p.m. The 44-year-old Salia is a Sierra Leone citizen and a permanent resident of the U.S., where he lives in Maryland. The United States is officially Ebola-free. Dr. Craig Spencer, the New York City-based physician who contracted Ebola while treating patients with Doctors Without Borders in Guinea, was dismissed from Bellevue Hospital Tuesday morning. He is officially Ebola-free, and while hundreds of Americans remain under observation, this places the United States back on the list of countries without Ebola cases. Dr. Spencer, 33, who had been in Guinea treating Ebola patients with Doctors Without Borders, was rushed to Bellevue by ambulance on Oct. 23 after reporting a fever of 100.3 to the authorities that morning. He was placed in isolation in a secure ward, and within hours a blood test had confirmed that he had the virus. His infection set the city on edge and set off a race to find his contacts over the previous few days, when he went bowling, dined out and rode on the subway and in an Uber taxi. By the end of Friday, Texas will be free of the deadly Ebola virus. The last person being monitored in connection with Texas’ three patients, a hospital worker who handled medical waste, is set to be cleared from twice-daily monitoring. Then the city and the state will be officially declared Ebola-free. “Today’s the day where Thanksgiving comes early this November because the Ebola crisis will be over,” Dallas County Judge Clay Jenkins said Friday. The number of people under “active monitoring” for Ebola symptoms has increased from 117 on Monday to 357 people Wednesday, health officials said. The vast majority of those being monitored arrived in New York City within the past 21 days from the three Ebola-affected countries, the New York City Health and Hospitals Corporation said in a statement. Top medical experts studying the spread of Ebola say the public should expect more cases to emerge in the United States by year’s end as infected people arrive here from West Africa, including American doctors and nurses returning from the hot zone and people fleeing from the deadly disease. Maine health officials obtained a 24-hour court order restricting Kaci Hickox’s movement after the nurse repeatedly defied the state’s quarantine for medical workers who have treated Ebola patients. A judge granted the order Thursday limiting Hickox’s travel, requiring a three-foot buffer if she encounters people, and banning her from public places until there’s a further decision Friday. The doctor who became the first confirmed case of Ebola in New York City remained in stable condition on Friday. Dr. Craig Spencer, 33, was being treated in isolation at Bellevue Hospital Center in Manhattan. Spencer returned from Guinea, Africa 11 days ago after treating Ebola patients there with the group Doctors Without Borders. The physician reported having a fever on Thursday to the Nobel Peace Prize-winning organization, which then alerted the city’s Health Department. That fever, initially reported as having been as high as 103 degrees was actually 100.3 degrees, NY Gov. Andrew Cuomo said. Ebola may have come to Harlem. A 33-year-old doctor who recently returned from the disease-wracked West African country of Guinea was rushed Thursday to Bellevue Hospital with symptoms of the deadly disease. Preliminary results of tests done on the doctor, identified by sources as Craig Spencer, are expected in the next 12 hours, the city’s Department of Health and Mental Hygiene said in a statement. Barely a week after being diagnosed with Ebola, Texas nurse Amber Vinson is free of the deadly virus, her family said Wednesday night. “We are overjoyed to announce that, as of [Tuesday] evening, officials at Emory University Hospital and the Centers for Disease Control are no longer able to detect virus in her body,” read a statement from a family spokesperson. Nine people in Connecticut who may have been exposed to the Ebola virus have been told to stay at home and are being monitored by local health authorities for symptoms, a spokesman for the State Public Health Department said on Wednesday. The federal government is closing a gap in Ebola screening at airports while states from New York to Texas to California work to get hospitals and nurses ready in case another patient turns up somewhere in the U.S. with the deadly disease. Under the rule going into effect Wednesday, air travelers from the West African nations of Liberia, Sierra Leone and Guinea must enter the United States through one of five airports doing special screenings and fever checks for Ebola. A handful of people had been arriving at other airports and missing the checks. A total of 562 air travelers have been checked in the screenings that started Oct. 11 at New York’s Kennedy airport and expanded to four others last week, Homeland Security officials said. Four were taken from Washington’s Dulles airport to a local hospital. None had Ebola. An American doctor infected with Ebola in Sierra Leone last month has gone quietly home after spending six weeks at Emory University’s special biocontainment unit, the hospital said Monday. The doctor, who has asked not to be named for now, was working for the World Health Organization when he was infected. “In coordination with the CDC and Georgia Department of Public Health, the patient was determined to be free of virus and to pose no public health threat. The patient has asked to remain anonymous and left the hospital for an undisclosed location. He will make a statement at a later date,” Emory said in a statement. Now, they revise the protocols? Gee thanks, assholes. The report from the Centers for Disease Control and Prevention noted that New York is key entry point for those coming in from West Africa, but apparently so far Ebola free. The administration’s Ebola evasions reveal its disdain for the American people. The second Dallas healthcare worker to be diagnosed with Ebola flew on Oct. 13, the day before she reported symptoms. The Centers for Disease Control and Prevention are asking all passengers on that flight to call the agency. According to the flight’s crew, the healthcare worker, 29-year-old Amber Jay Vinson, showed no signs or symptoms of illness while on Frontier Airlines Flight 1143 from Cleveland to Dallas-Fort Worth. She was reportedly in Akron to visit family, according to the Ohio Department of Health. Because Vinson wasn’t showing any symptoms of Ebola while on board the flight, it is very unlikely she could have infected other passengers. The CDC is taking extra precautions in this case because Ebola is such a severe virus. If Vinson had been symptomatic on the flight — if she’d had a fever, for example — she could have transferred Ebola to someone else only through direct contact. How about you try not flying with a potential deadly virus? 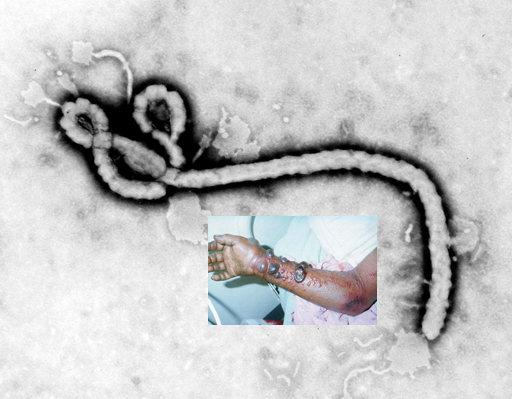 Infected Ebola patients are not considered contagious until they have symptoms. The airplane crew said the woman had no symptoms during Frontier Airlines Flight 1143 from Cleveland to Dallas-Fort Worth on Monday. She flew from Dallas to Cleveland on Oct. 10. The CDC said it is alerting the 132 passengers who were on the return flight “because of the proximity in time between the evening flight and first report of illness the following morning.” Officials are asking them to call the health agency so they can be monitored. via CDC: 2nd hospital worker with Ebola took flight | HamptonRoads.com | PilotOnline.com. A second Texas health care worker involved in treating a Liberian patient who died of Ebola has tested positive for the disease, officials said Wednesday, marking the second such worker and third person overall to be diagnosed with the virus on U.S. soil in the past several weeks. The unidentified worker helped care for Thomas Duncan, an Ebola patient who died one week ago at Dallas’ Texas Health Presbyterian Hospital, after Duncan was diagnosed with the disease following travel from Liberia. The unknown medical staffer was isolated after reporting a fever Tuesday, whereupon he or she was tested for Ebola. The results returned positive from a state lab in Austin around midnight, according to a statement from the Texas Department of State Health Services. RICHMOND, Va. — A patient has been isolated at VCU Medical while diagnostic tests are conducted to see if Ebola testing should take place. CrossOver Health Ministry, located in the 100 block of Cowardin Avenue, said they “don’t believe it’s Ebola,” but initially isolated the patient and took the necessary precautions to evaluate any risk. The patient traveled to Liberia, a country of concern in the rapid transmission of Ebola, a couple of weeks ago. WHO assistant director-general Dr. Bruce Aylward gave the grim figures during a news conference in Geneva. Previously, WHO had estimated the death rate at around 50 percent. Aylward said the 70 percent death rate was “a high mortality disease” in any circumstance and that the U.N. health agency was still focused on trying to get sick people isolated and provide treatment as early as possible. Dr. Anthony Fauci, director of the National Institute of Allergy and Infectious Diseases, told ABC’s “Good Morning America” that federal health authorities should consider requiring that Ebola patients be sent only to highly specialized “containment” hospitals. I’m sure it won’t be long until 0’s wife has a long face picture with a new hashtag campaign. I have a better idea: Stop allowing people who travel from the countries with Ebola infection to enter the US. Texas health officials said early Sunday morning that a healthcare worker at a Dallas hospital has tested positive for Ebola, even though the worker followed Centers for Disease Control and Prevention (CDC) precautions and was not part of a high-risk pool. “A health care worker at Texas Health Presbyterian Hospital who provided care for the Ebola patient hospitalized there has tested positive for Ebola in a preliminary test at the state public health laboratory in Austin,” the Texas Department of State Health Services said in a statement. The first patient diagnosed with Ebola in the US, Eric Duncan, has died, a Texas hospital says. Thomas Eric Duncan, who caught the virus in his native Liberia, was being kept in isolation in a Dallas hospital and receiving experimental drugs. Public hospitals in New York City are concerned enough about Ebola that they’ve secretly been sending actors with mock symptoms into emergency rooms to test how well the triage staffs identify and isolate possible cases. Since July 20, the day Nigeria’s so-called “Patient Zero” arrived in Lagos, officials have recorded a total of only 19 cases, with no new cases since Aug. 31. Last week, on the same day the US confirmed its first case of Ebola, the Center for Disease Control (CDC) proclaimed that Nigeria had stopped its outbreak. But Fauci emphasizes that the United States is different from African nations whose fragile health care systems have been overwhelmed by Ebola. Scientists know how to stop the virus from spreading with adequate resources, he says. He was about to embark on a three-leg journey, traveling from Africa, through Europe and into the United States. He would travel more than 8,000 miles before arriving at Dallas/Fort Worth International Airport in the early evening of Sept. 20. Texas. His temperature, taken before he boarded the plane in Monrovia as part of precautionary government measures, had been below normal. But when he walked out into the steamy Texas night, he carried with him one of the deadliest diseases known to medicine. Ten days later, he’d become the first person diagnosed in America with Ebola. “We”? “We” know how to support stopping outbreaks in low mobility countries on the African continent. “We” have never faced a lethal, contagious virus like this in the US. Residents of the US, with unrestrained interstate travel, are much more mobile than residents of the various African countries afflicted with Ebola. Current flu strains are most lethal to physically weak (very young, infirmed, elderly). [The 1918 Spanish Flu was 15% fatal among all cohort groups.]. Ebola is 3 times more lethal. Ebola knows no racial, economic or political boundaries. 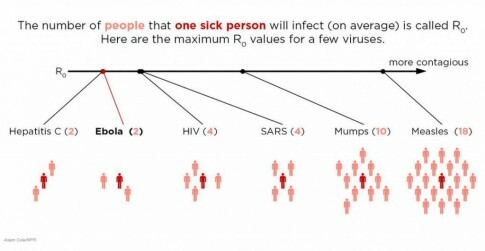 Ebola’s lethality (50%) is higher than the 14th century’s Black Death (30% to 40%) or the 1918 influenza pandemic’s (15%); a viral infection that killed 3% to 6% of entire human population living on the planet in 18 months.